Wilderness View Cabins is nestled in the heart of the Chattahoochee Forest and sits right next to Fort Mountain State Park. If you are a hiker or mountain biker, The Pinhoti Trail can be accessed across the street from our cabins and Bear Creek is just down the road. Fort Mountain is a favorite route of road cyclists who come from all over the country to experience its challenges and hikers climb our scenic mountain byway to meet the Appalachian Trail. If fishing is your passion, you can walk from your cabin to our catfish pond in less than five minutes or drive 10 minutes to many excellent trout fishing spots. You can even hire a fishing guide who’ll teach you to fly fish and take you to favorite hidden rivers and streams where trout abound. If you like adventure, try navigating the Ocoee by kayak or white water raft, tubing down the Coosawatee, Ellijay or Cartecay Rivers, or reaching new heights by zipline. All are a mere 20-40 minute drive from Wilderness View Cabins. 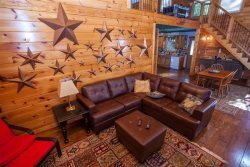 Whatever outdoor activity you’re in the mood for, Wilderness View Cabins, in the north Georgia mountains, has it: fishing, hiking, swimming, rafting, golfing, biking, tubing, and horseback riding. With endless days of clean mountain air and cool breezes, surrounded by the most beautiful setting in the state, you’re sure to come back again and again.